Recently I finished caulking the seams of the baseboards in the master bedroom and closet and then painted them all in glossy white. Because the guest room bed was covered in projects from the office I had to keep sleeping in my room while moving everything around. 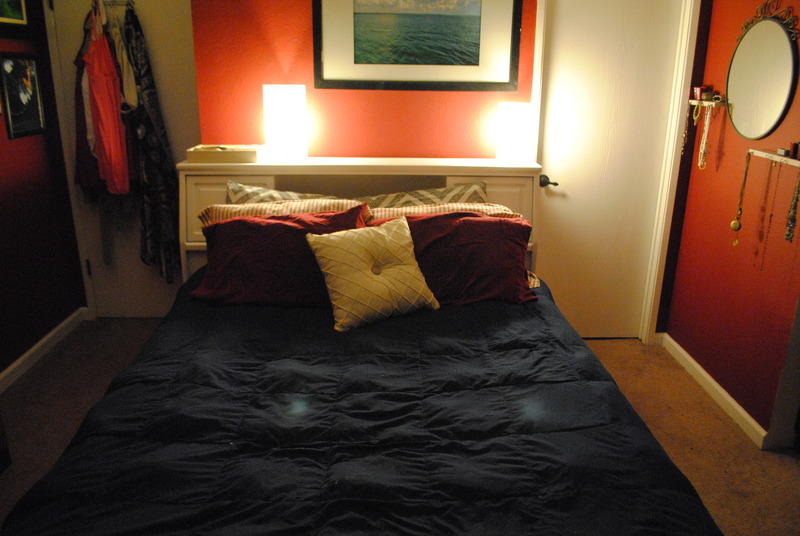 The biggest change was taking out the white bookshelf, it’s now in the hallway between the guest room and office. 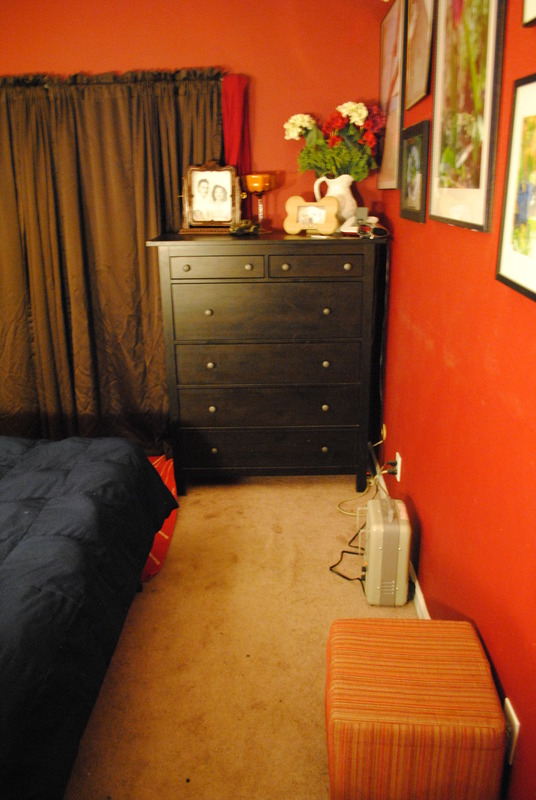 The headboard and mattress barely fit on the wall between the hallway and bathroom so there was no room for the nightstands. Yes, the picture on that wall is off center and drives me batty but it’s not moving just yet. Now when you walk in the room the dresser is straight ahead and the arrangement here makes it easier to plug in the alarm clock, iPod speakers and space heater. 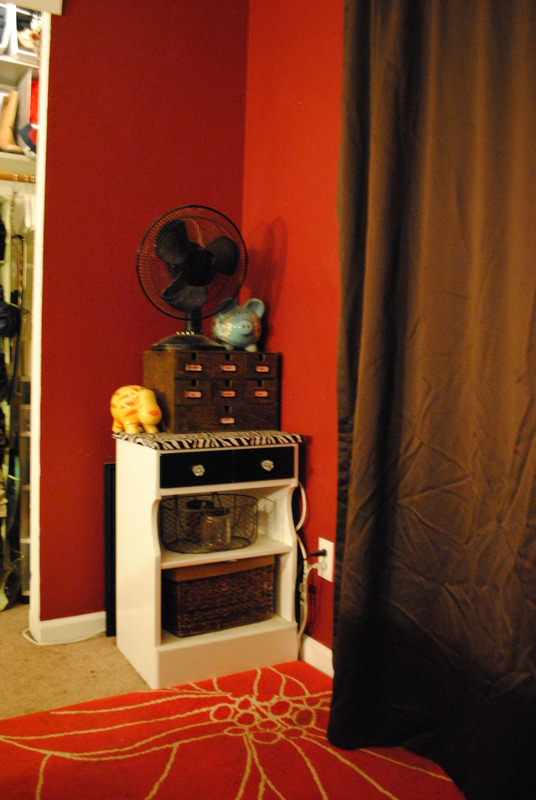 Where the bookshelf was is now the first nightstand with my Ikea organizer and the fan on top. I store my spare change in the piggy banks and the baskets hold dog treats and cards. On the far left are my shirts and underneath are my suitcases. 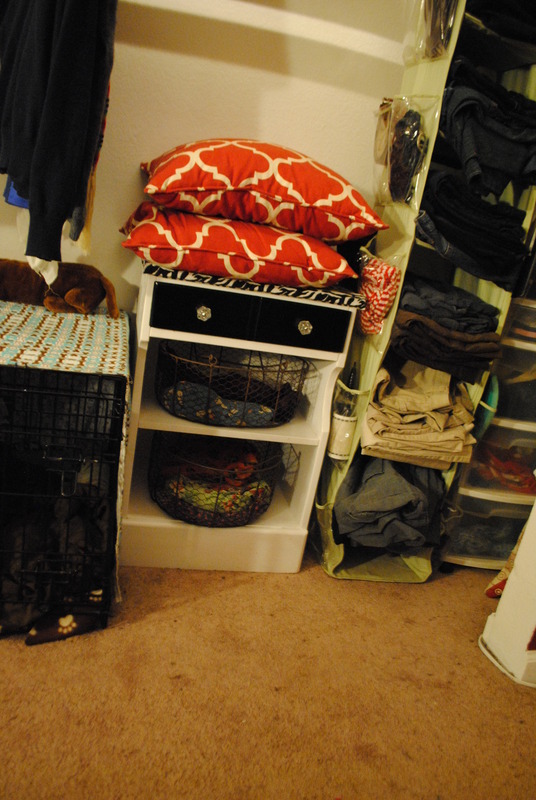 In the middle of the closet are the two dog crates and I’ve covered them with the flannel crate covers that Mom sewed for me. I used safety pins to keep the covers in place and this should help keep the dogs cozy at night. 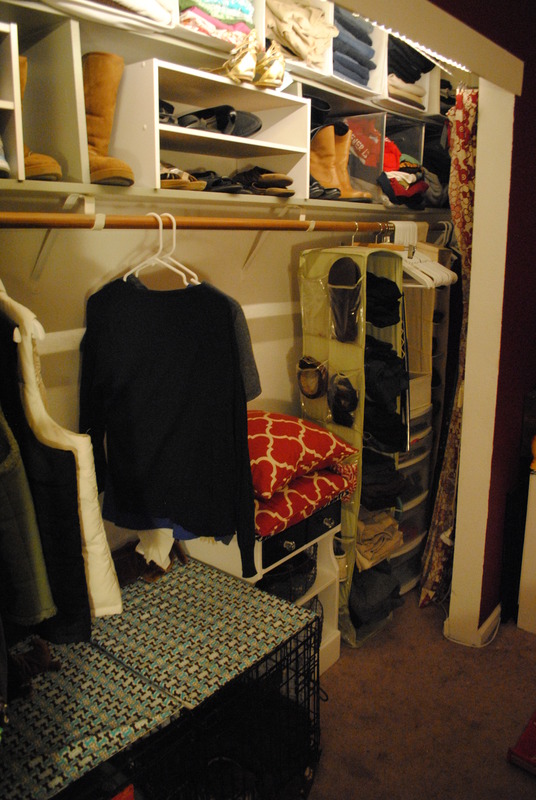 On the far right of the closet are long dresses, a shoe organizer, pants organizer and plastic drawer. Most of this stuff can be re-evaluated and possibly donated or thrown out – I’ve been letting go of a lot of clothes I don’t wear often enough and getting a lot more room in here. Overall I love how open the room feels, especially since I can now walk to the back door to let the dogs out 100 times a day much faster! I decided the first step was to stain the wood and although I had a light and dark stain already, I picked out Jacobean because I loved the rich color. Staining is super simple, using sponge style paint brushes you dunk in the stain, brush it on and then wipe it off 5-10 minutes later. 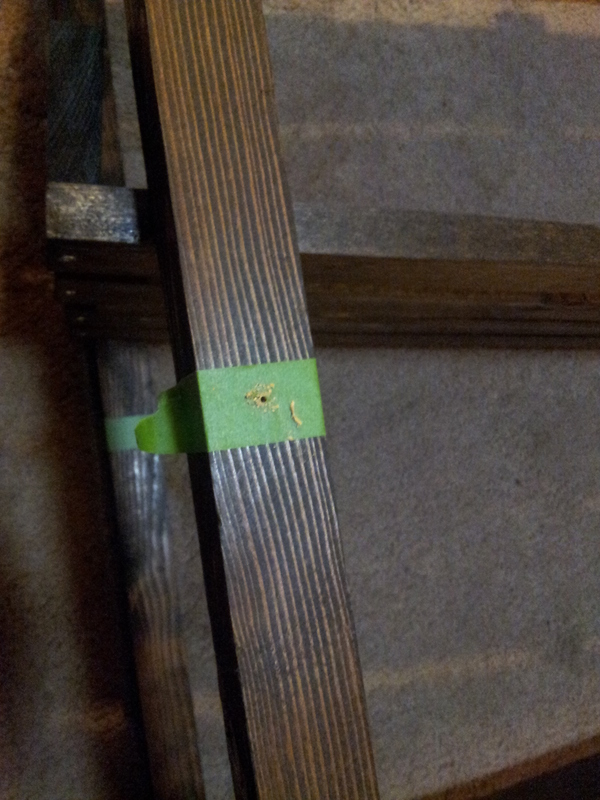 This wood is pine and had no trouble soaking up the new color. 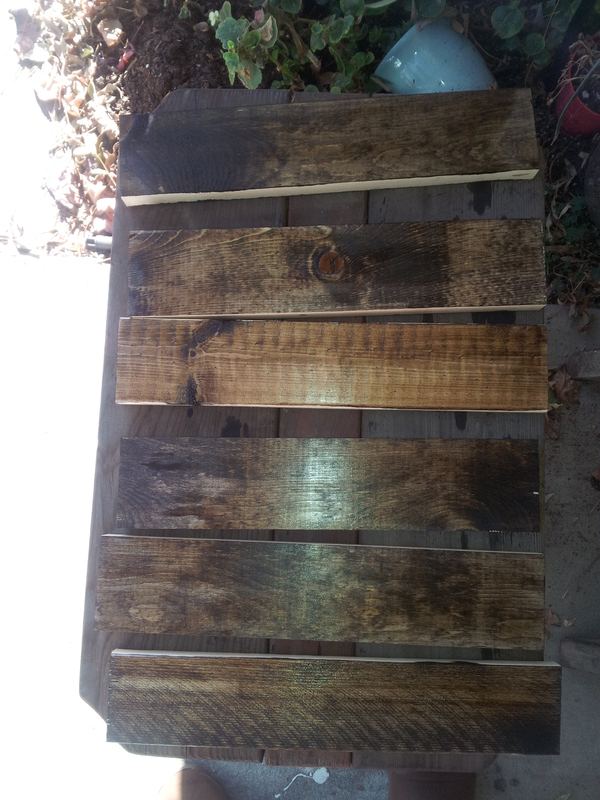 I set these up outside on a couple of side tables that are on my list to sand and stain or paint. The wood stayed outside or in the garage until it was cured – typically 2-3 days for the smell to dissipate and fully dry. 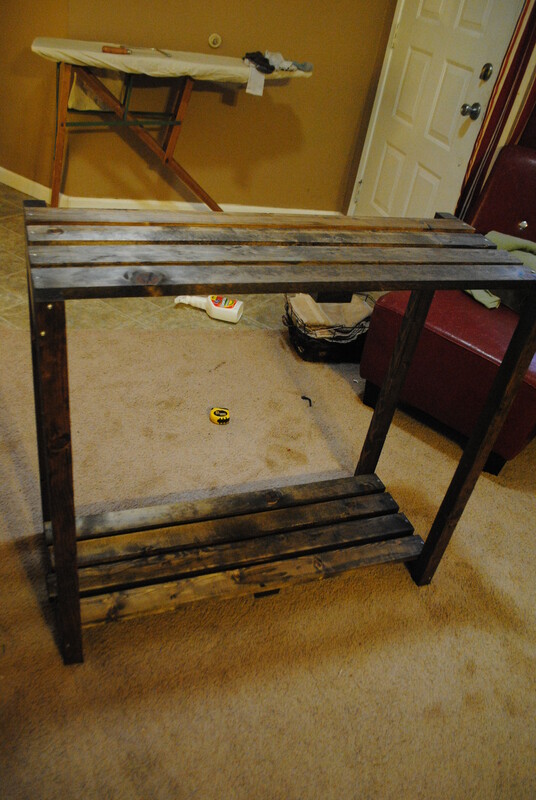 You can re-apply the stain or even the poly coat but I wanted to get to building before too long. 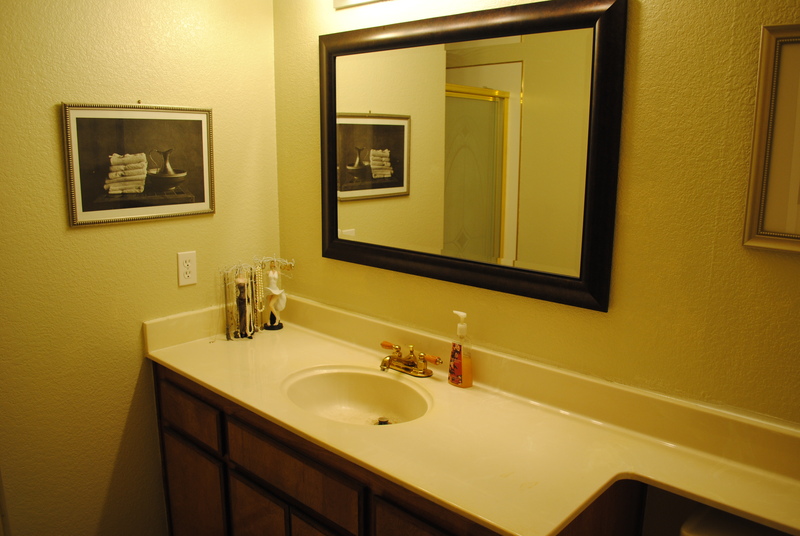 I started by re-measuring the width between the bathroom sink and wall and was able to keep the shelves 12″ deep. 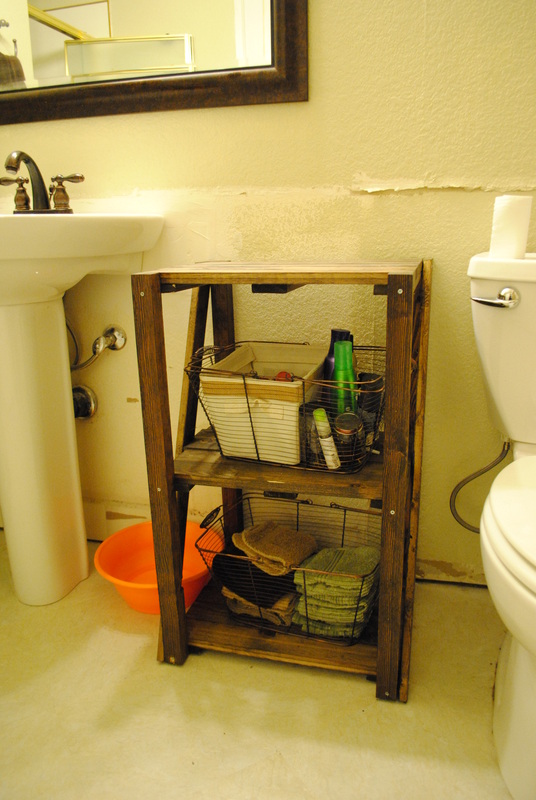 The 4 vertical posts were 33″ tall and the shelves each had 4 long strips of wood. 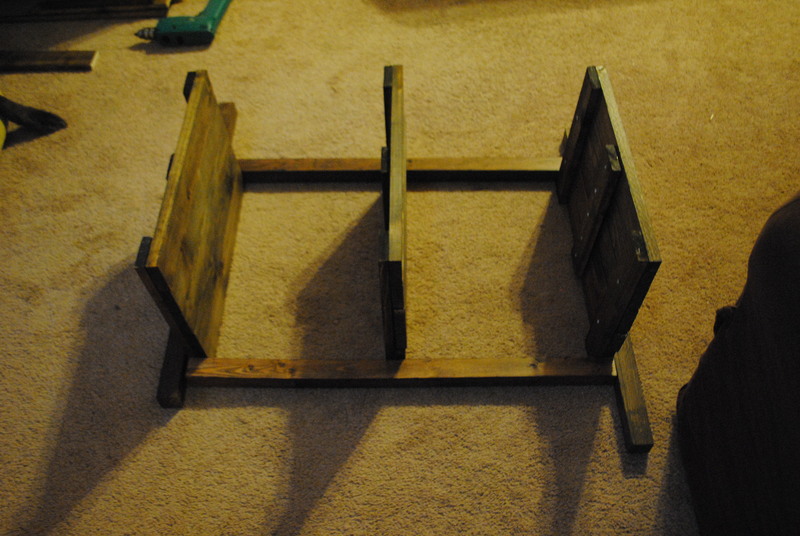 After all the wood stain was dry I began assembling the shelves, then secured them to the posts. 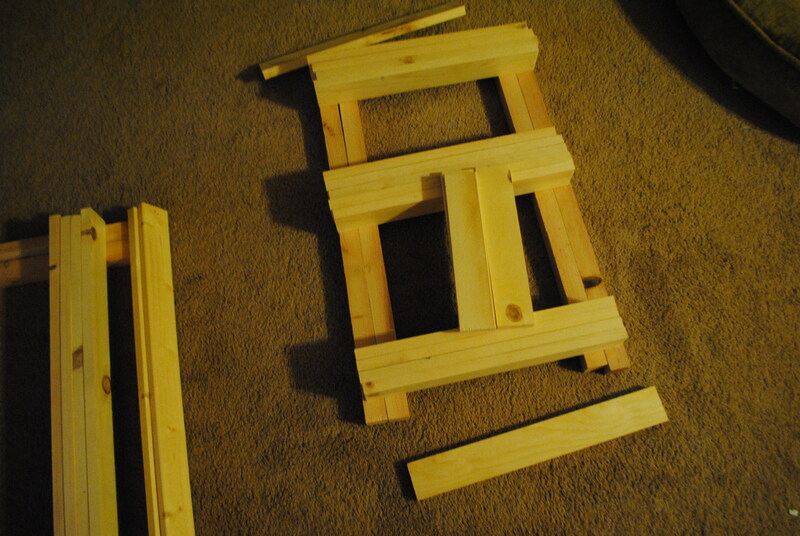 I drilled holes with a drill bit first and then used 1″ flat head wood screws. After building the shelves I laid them out on the posts, 2 at a time: Once the 3 shelves were assembled I could secure them to the posts. Unfortunately the 1″ wood screws wouldn’t go through the post and into the shelf board so I was back to the store to get longer screws. To assemble, I laid out shelves on their long edge (using some boxes to stabilize them) and then laid two of the posts on the edge. I added the top and bottom shelf first, to make sure it was square. The next decision was the placement of the middle shelf and for this I grabbed a few of my ORB metal baskets which were going to be used. 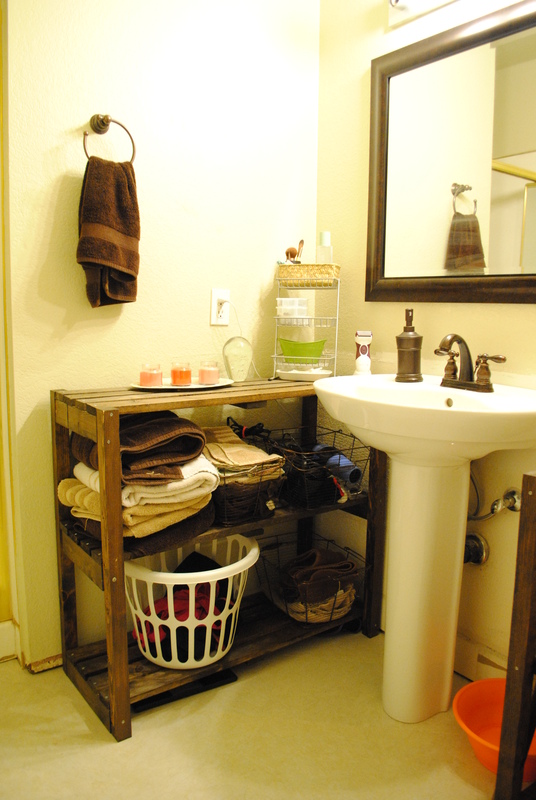 These baskets were another reason why I wanted the rough wood texture – if the baskets were on a smooth white finish they would easily scratch up and stain the paint. I wanted enough clearance between the shelves so the baskets wouldn’t be a tight fit. 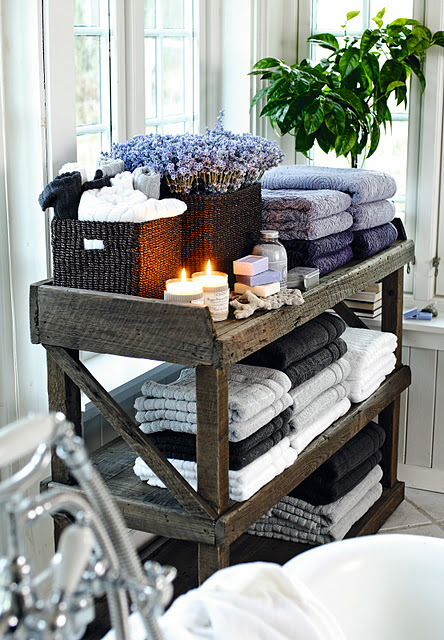 If the baskets don’t stay on these shelves there will still be room for stacks of towels. Both are looking good and I’m happy to have them done! The Master Bathroom has been “in progress” for close to a year now. 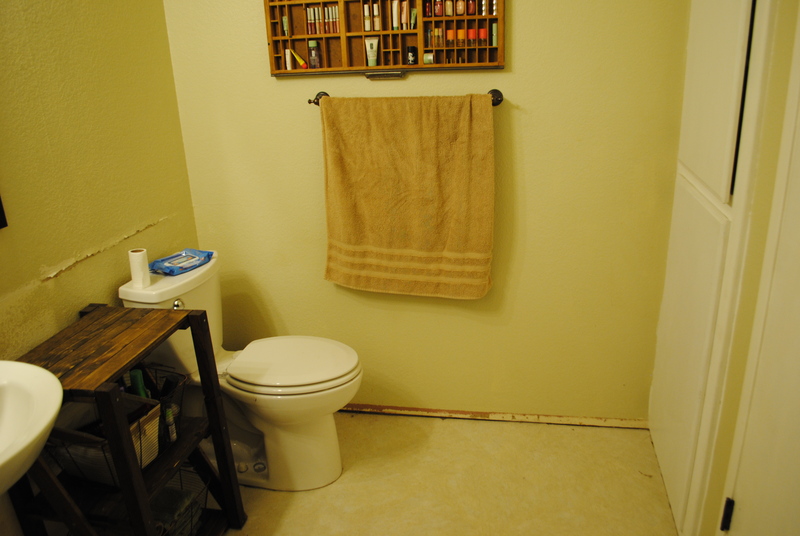 Since before I tore up the bathroom floor or took out the sink, installed the new floor or installed the new sink, I had this project in mind. I was not sure how I would execute it because I didn’t have exact dimensions until the sink was installed and the bowl could be measured. Now, the only problem with this source is that it’s in a foreign language and doesn’t trace back to a site with directions. Bummer. So I studied it. And stared at it. And looked at my butcher block which had a similar design. It took a few nights but I sketched out the design I wanted and then started writing out the wood cuts. When we took out the cabinet and counter top the back splash tore up the drywall pretty bad. Knowing that we were going to cover it up saved us the trouble of fixing it. I purposefully chose a 3″ tall baseboard with top grooves, then a 32″ tall bead board panel and is capped off with 3″ tall chair rail. This gives me a total of 38″ – just over 3′ – which more than covers the damage to the drywall. Keeping in mind the height of the chair rails I decided the shelf should be shorter for a few reasons. #1 is that I would hate to scuff up my pretty new white trim. 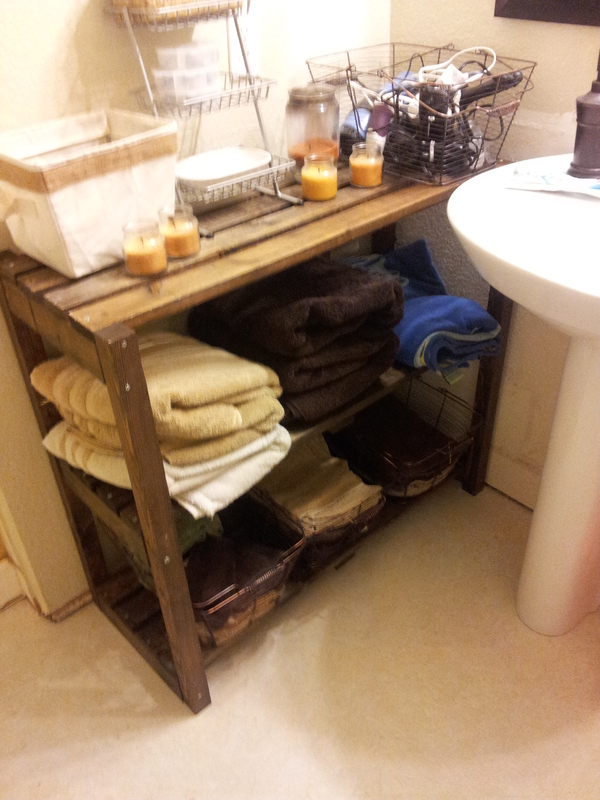 #2 the shelf would be distracting to the clean lines of the trim and #3 I need space on top for a hand towel to hang. This shelf was so tall the hanging towel holder wasted half the space on the top shelf. Also, the outlet was hard to reach behind the shelf. As you can see, I have the same tiered thing on the top (I think I bought that for $1) and it holds my makeup brushes, plastic rounds with my earrings, hair clips and q-tips. On the top shelf is also my glow in the dark jellyfish and some candles. 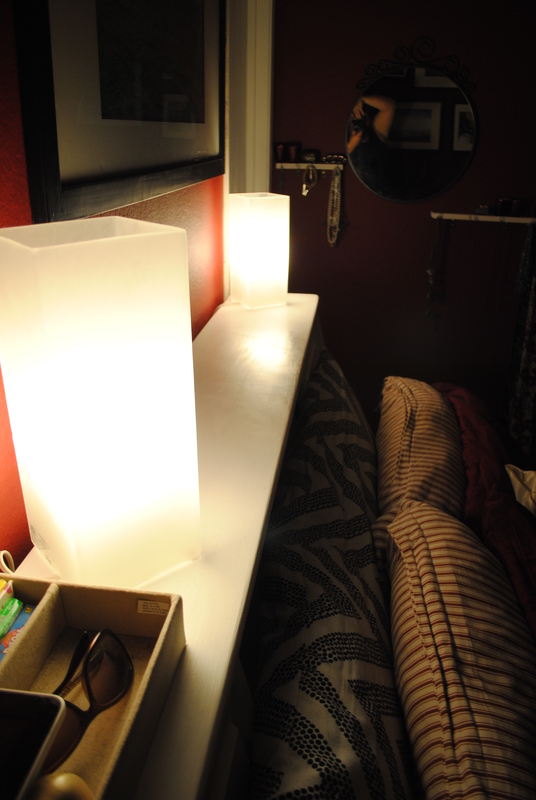 See how the shelf is low enough not to catch the towel on fire when I light a candle? Important, that is. 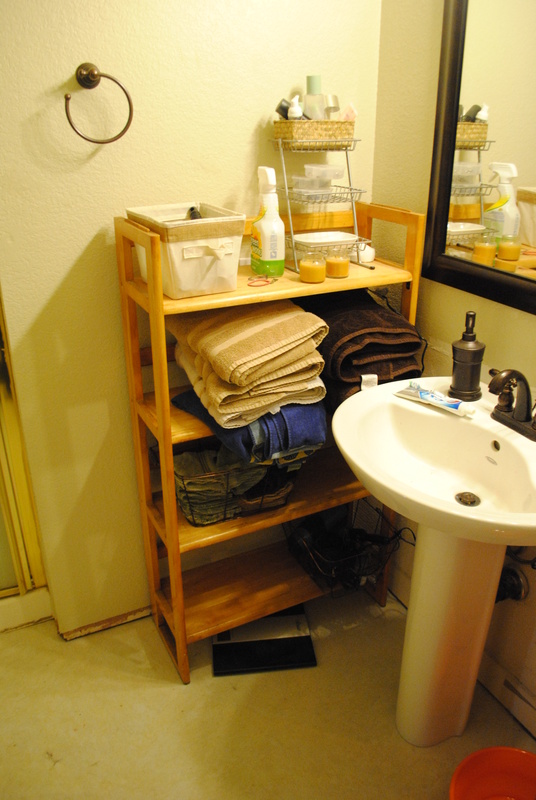 The second shelf has my towels, a basket with hand towels and a basket with hair dryer, curling iron, etc. This shelf is both shorter in height (by a few inches) and in width. Still there’s enough room for these baskets, the bottom one has all of my wash cloths and the middle basket has hair brushes, gel, etc. Here’s looking back at the other corner (from the shower). We still need to install the baseboards and beadboard. You can see the damage to the drywall on the wall behind the toilet. Ignore the toilet paper, once the bead board is installed I’ll add the new holder. 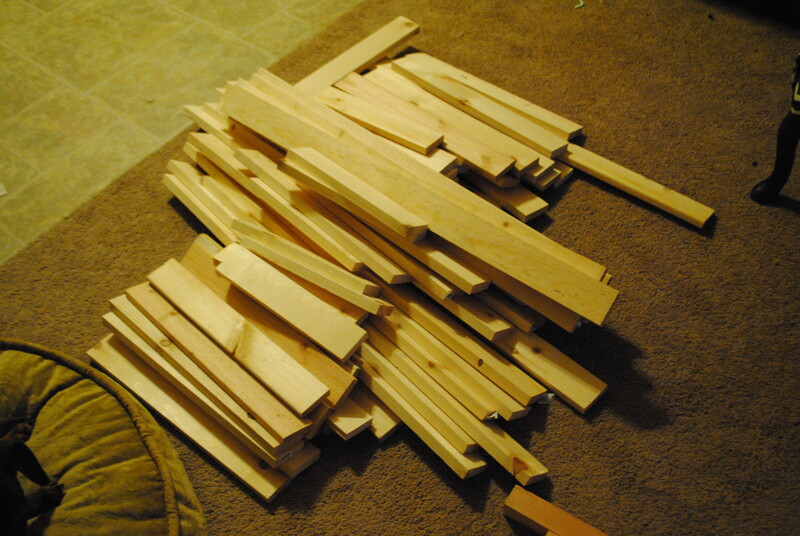 This post is getting a little long so I’ll create another one with specifications on how I assembled those shelves. 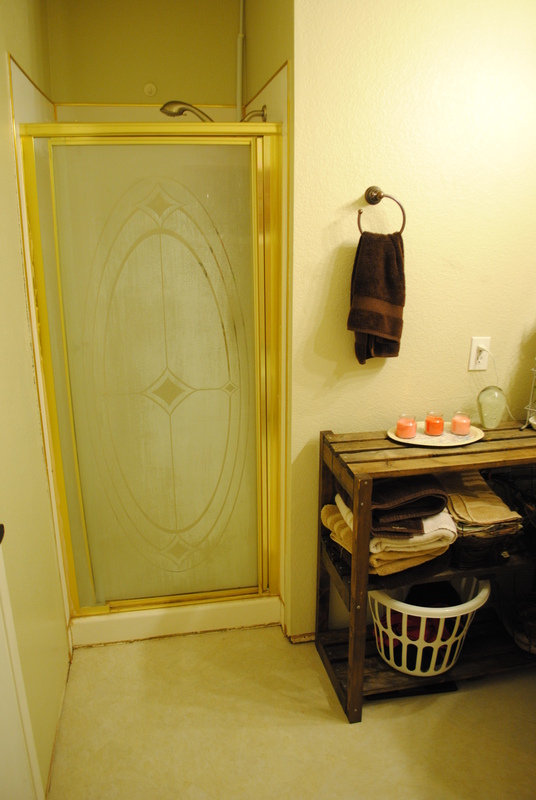 Still, the bathroom is looking so much better, more open and easier to navigate! Back in November I began NaNoWriMo for the 7th year and was pretty confident about finishing a new novel by the end of the month. But then I was quickly sidetracked by anything that I could find as a distraction. Unlike previous years I never did go back to writing, allowing myself that “failure” as I focused on other things. First up, I emptied the office of everything I could which meant everything except the desk. Then I crawled around the room on my knees, caulking the baseboards that we installed years ago, then painting them, then going back along to touch up the wall paint. Then I grabbed my step stool and touched up the paint along the ceiling too. Oh and the white paint on the window sill paint had not covered the primer well so I touched that up as well. All that was fine. It felt good to “finish” the paint and I even had AT&T come out and repair my phone jack. They replaced the yellow cover with a crisp white one so it doesn’t look so 80s. It was nice to have the room “clear” of all the normal stuff and I stacked stuff up in the guest room so I could go through it all and sort. 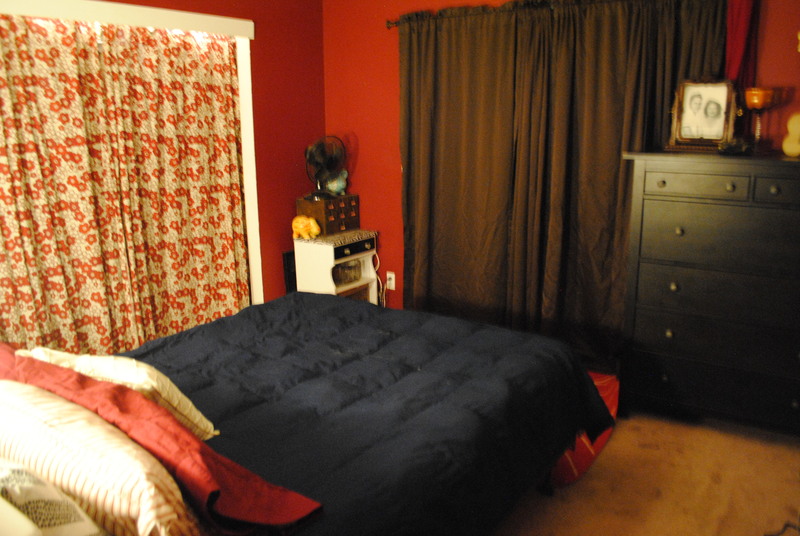 Since the guest room was pretty empty to begin with and I had a nice big queen bed, I had space to go through everything. I found books by the dozens that I could donate and began giving them away on a book exchange site. 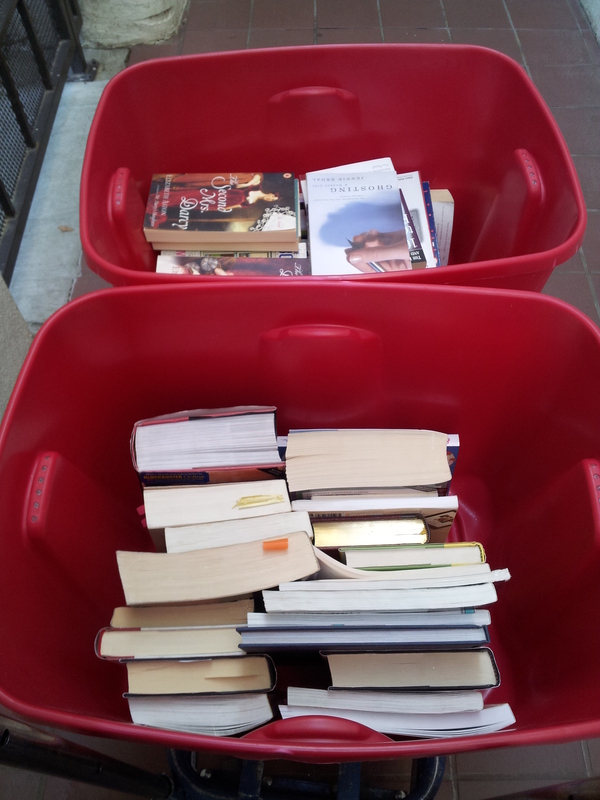 The remainder of the books went to the local library. In all 141 books left my office in about a month. 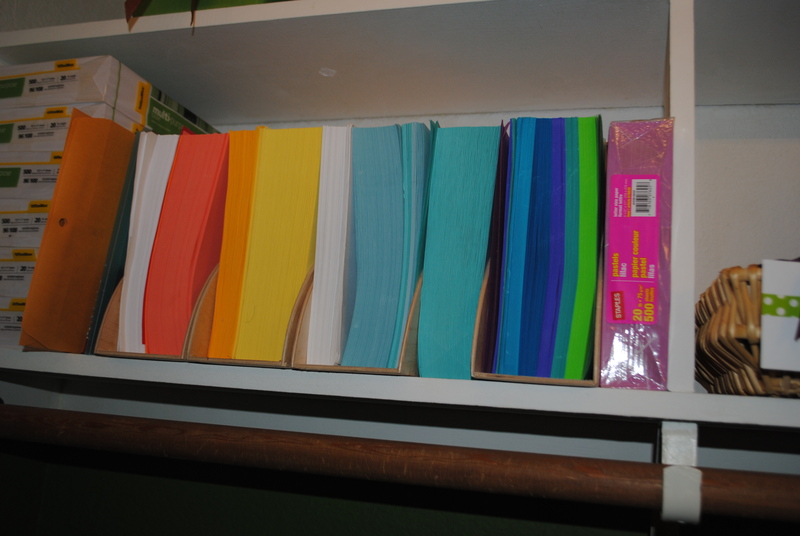 Then I went through the office supplies, often spread out in many different places. 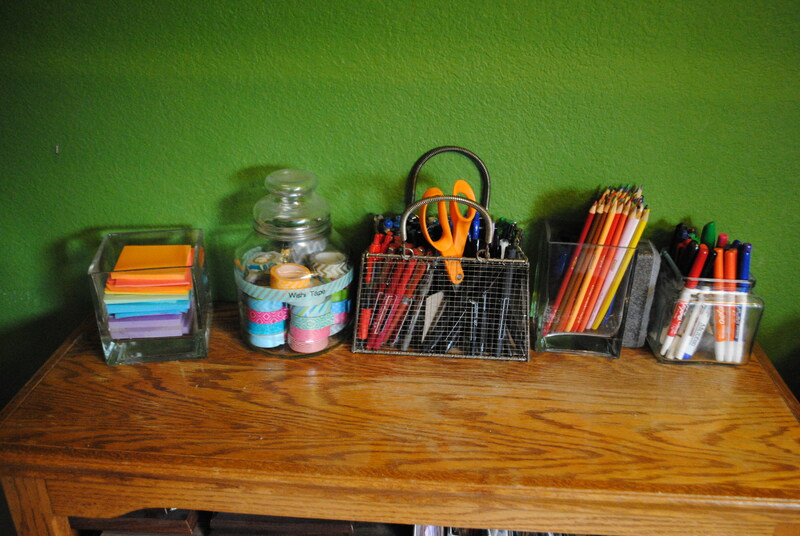 I found a few hundred pens I could donate, printer paper, blank journals and note cards and gave them away on Freecycle. Next I went through the boxes from electronics and pared things down. Found boxes I could recycle, papers I could throw away, things I could downsize. 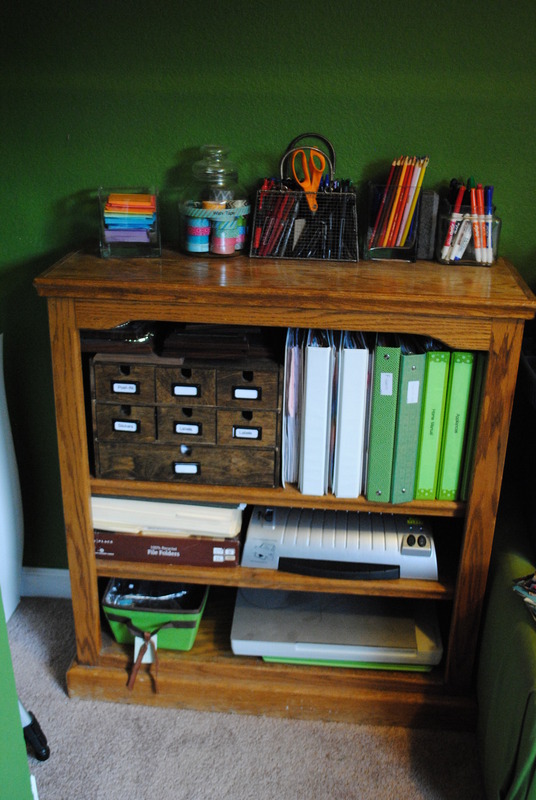 The file cabinet I was using has not been used in ages so I put it up for sale and got it out of the house. The Ikea bookshelves went into the dining area and are holding an endless supply of boxes for photos, clippings, decor and china – all of which I’ll need to make decisions about soon. So I went about restocking the office – slowly – bringing back in only what I need and will use. 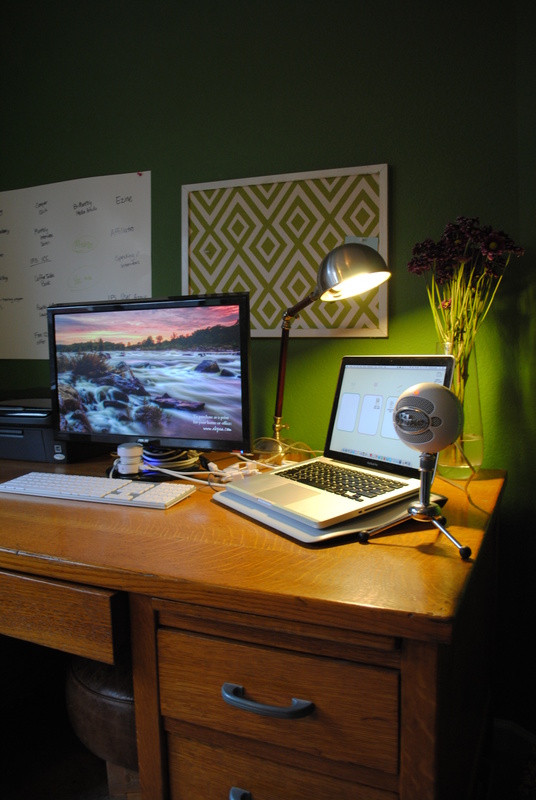 The desk remained so I simply set up the monitor and a new keyboard to make the best use of space. I would like to find a wireless mouse or find a better port system for all my USB enabled devices. Even after donating loads of printer paper I still have 6 reams unopened. They’re neatly stacked up here so I can break into a new pack when needed. This shallow basket holds my label makers – it’s shallow and open so I can get it out quickly – if you make your tools readily accessible then it’s much easier to actually, you know, use them. I found the basket above and used it to collect my mail when I was on my 3 week road trip in the fall. I decided to re-purpose it to hold filing. 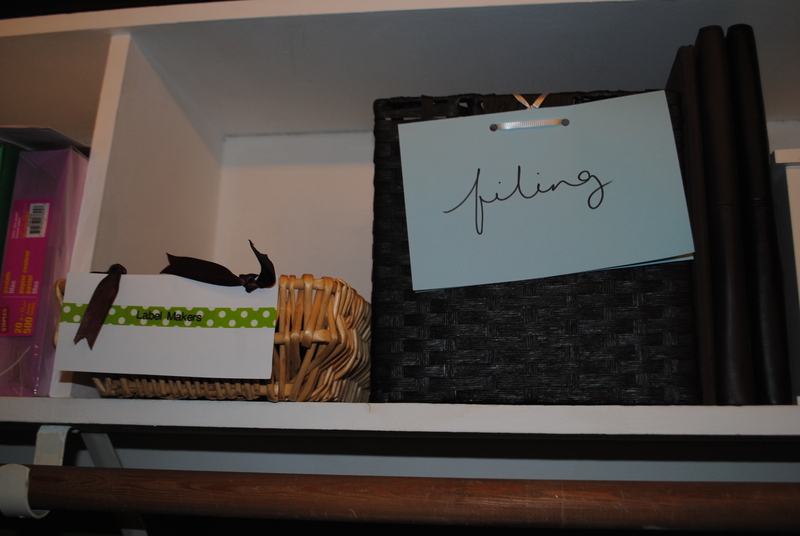 Next up is the white storage box that holds all my batteries – I’ll have to show you how they’re organized some day. I used some of the white boxes from Ikea that used to be on my bookshelf for CDs and my business cards. The top shelf is a little tricky to stock because while the Banker’s Boxes fit there easily, the height makes it hard to get boxes down and thus clutter tends to accumulate. 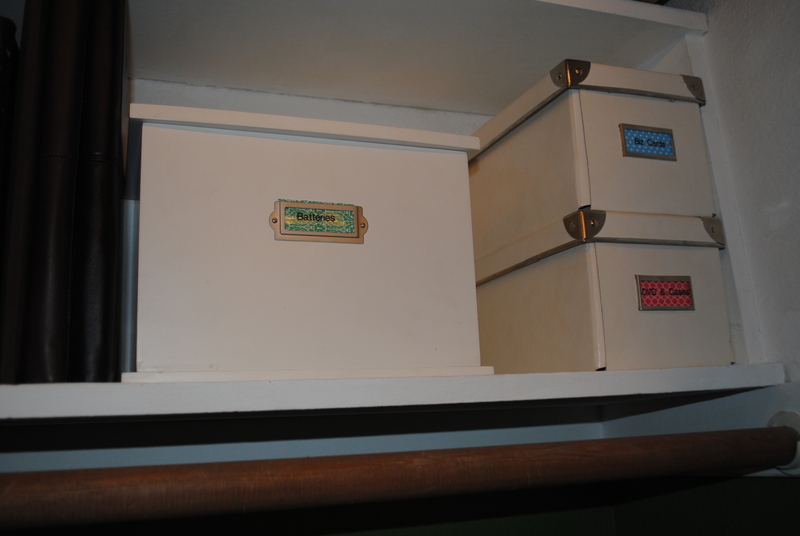 Right now I’ve got the two file boxes (labels pending), some empty boxes and that’s it. 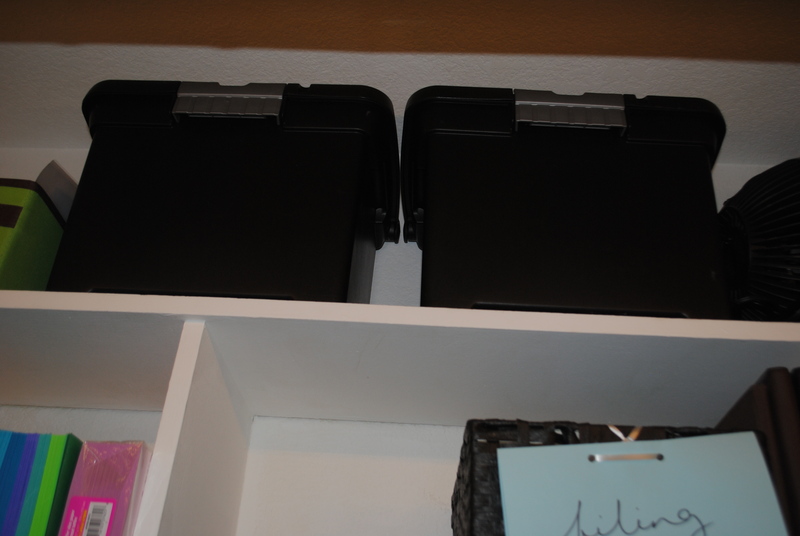 I’m also adding boxes to hold my client gifts and my camera equipment. 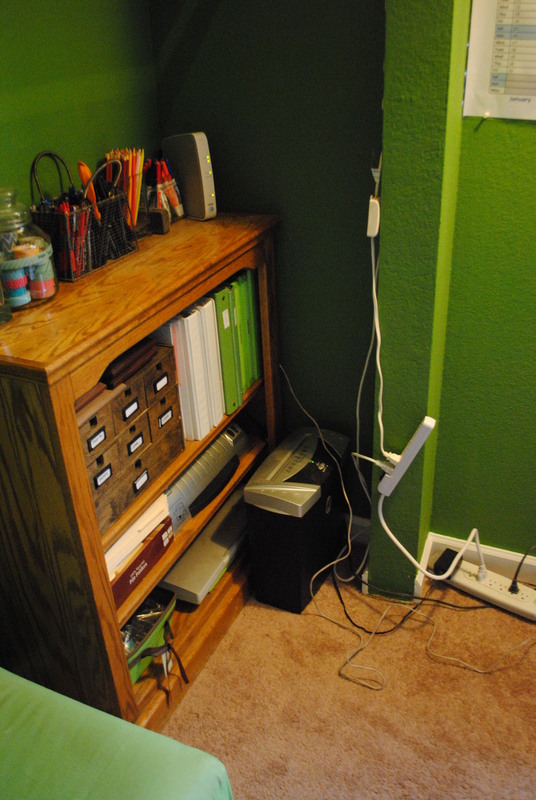 The second part of the mini closet makeover is the bookshelf which is older and not in great shape. The finish matches the desk, however, so I’ve decided to keep it for now. 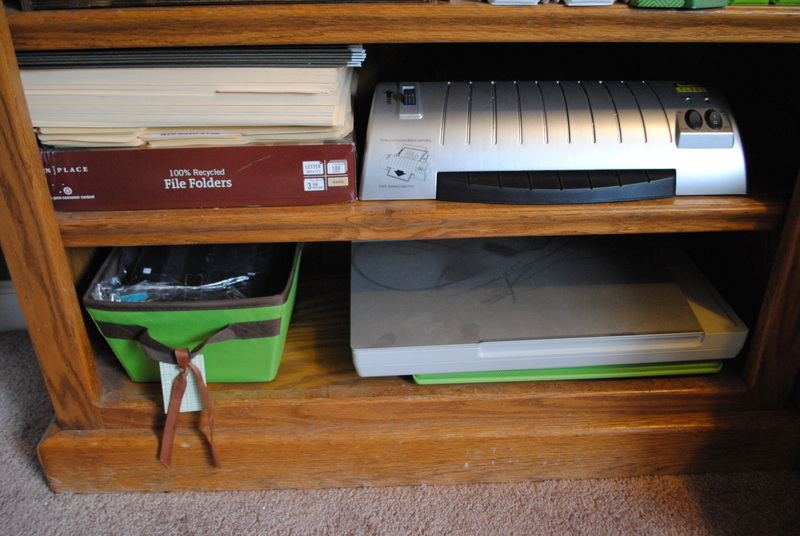 The bottom shelf holds my flatbed scanner and underneath is a spare laptop cooling pad (which is broken). 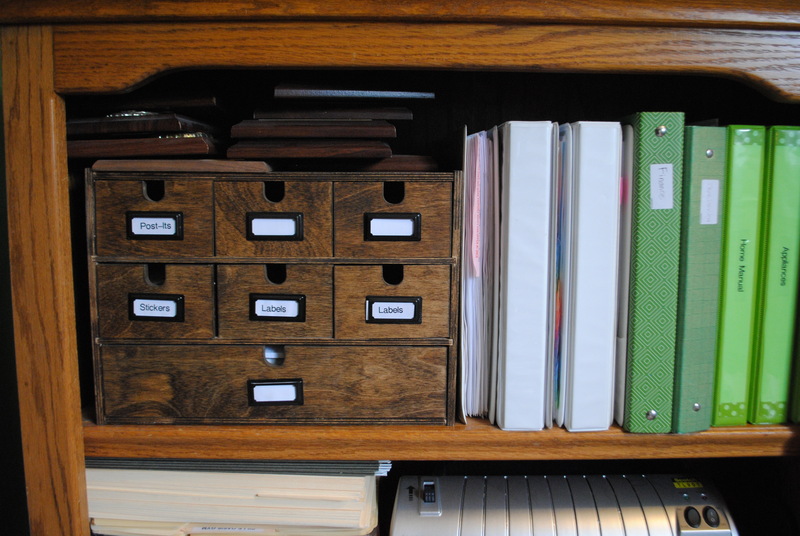 The middle shelf holds my file folders and hanging file folders, all unpacked so they’re easy to grab and label and my new laminating machine. The top shelf has my remodeled Ikea organizer (now with labels!) as well as all my business binders. 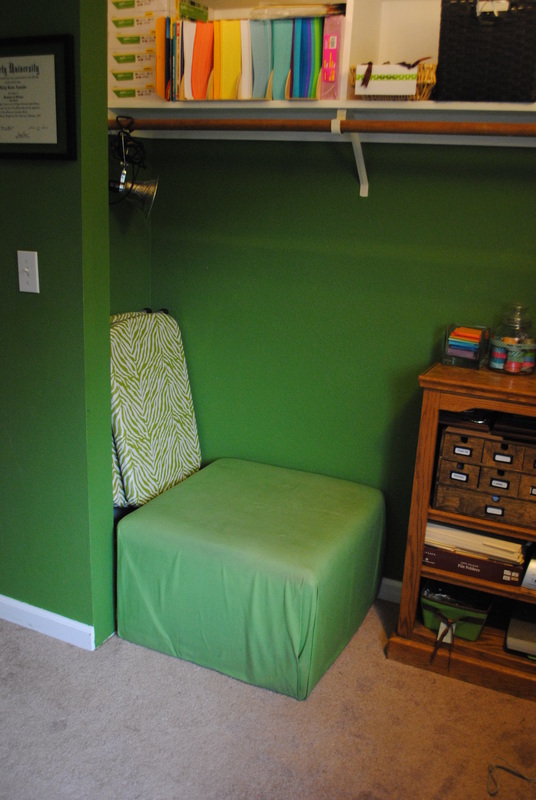 My 2 zebra striped pop up tables are stored in this closet, they fold up really nicely. I moved in the green footstool for seating, the dogs like to sleep here when I’m working in the office and it’s a convenient place to sit while shredding papers or laminating. In this left corner of the closet I store my tripod and lighting kit for shooting videos (see the light hanging on the clothes rod?). Since most of my videos are staged in the office it’s a handy place to keep everything within reach. 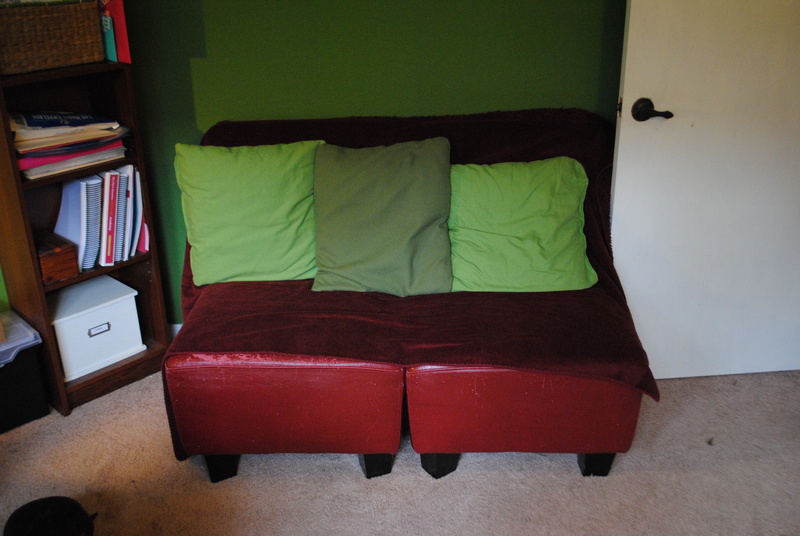 After making such big changes to the room, I chose not to bring in the bookshelves again. 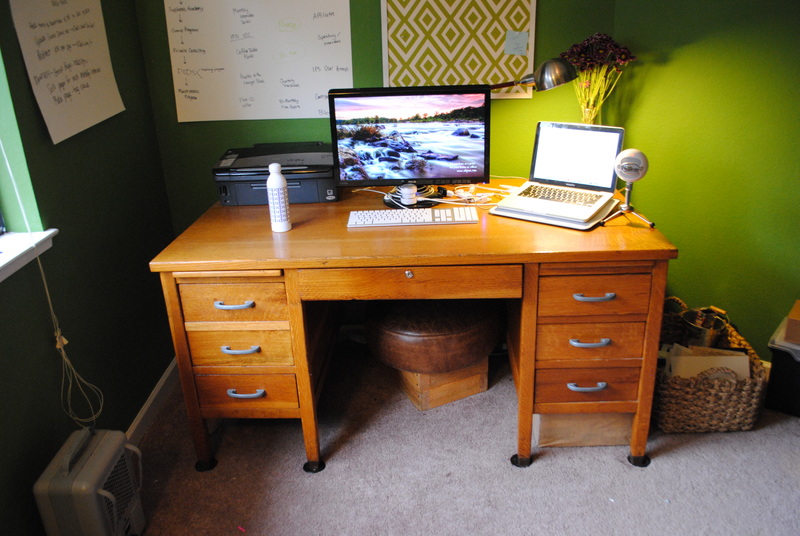 Instead I kept the desk (because it’s too big to go anywhere else) and the desk chair. On the desk is my printer, desk lamp and extra monitor. 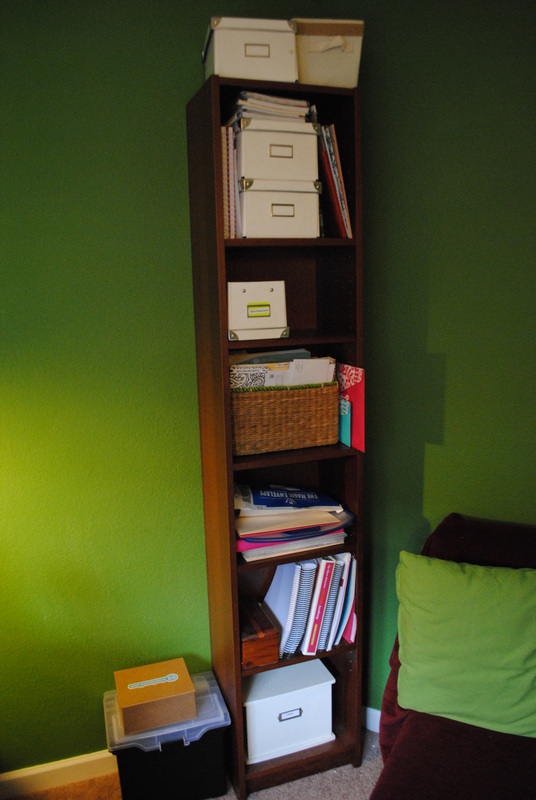 I kept just one bookshelf in the room, this tall, skinny one from Ikea. It’s filled with boxes and my journals (which I’m still sorting through slowly). The file box on the floor has all of my tax paperwork and the cardboard box is for collecting my receipts via Shoeboxed. Finally, the 2 red chair have migrated in here as well – I’d like to replace them with an overstuffed chair but that’s low on my priority list right now. It’s a convenient place to sit for my videos and the dogs tend to like perching up here while I work. With the exception of my big laminated 2014 calendar not much is up on the walls. Just the pin board behind the desk and a few bulletin boards with notes for my current business projects. Right now I’m really liking how empty the room feels. 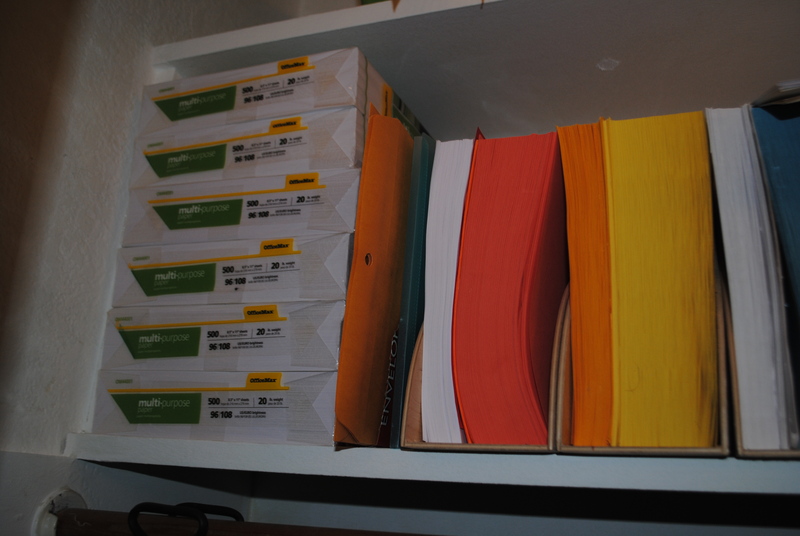 I still have a ton of papers (always) that I’m referencing for clients or projects. Half the time I’ll just sit on the red chairs and write with the heater keeping the room toasty warm. 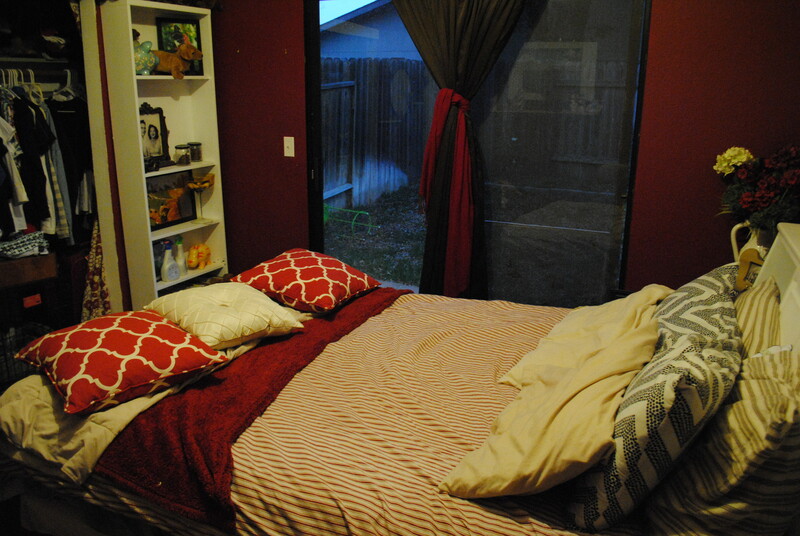 Jackson’s older bed is in here as well because I like to have the dogs nearby so I can keep an eye on them while I work. It’s a far cry from the office I was working in last year which was stuffed floor to ceiling. With so many books gone and reducing my papers and office supplies, It feels like I have more space than ever. Reading back over the past few months worth of posts, I realize that I’ve been teasing you about new project posts without delivering. My bad. This weekend my goal is to wrap up a lot of little cleaning projects so that I can photograph the big, remodel and design projects that I’ve been working on for the past few months. Most of the blog posts are already written with (insert photo) throughout. I won’t overwhelm you with 12 project posts at once but it will be nice to have more content on this old blog here. Note: after 2 months of dry weather California is finally experiencing some moisture. Unfortunately that looks like catching up on all our rain this week. Since I would really hate to work on the gutters or do work in the garage while it’s this cold, inside work it is.